String Theory predicts the existence of more than the 3 space dimensions and 1 time dimension we are all familiar with. According to string theory, there are additional dimensions that we are unfamiliar with because they are curled up into tiny complicated shapes that can only be seen on tiny scales. If we could shrink to this tiny, Planck-sized scale we could see that at every 3D point in space, we can also explore 6 additional dimensions. This animation shows a Calabi-Yau surface which is a projection of these higher dimensions into the more familiar dimensions we are aware of. The earliest version of string theory, called bosonic string theory, incorporated only the class of particles known as bosons, although this theory developed into superstring theory, which posits that a connection (a "supersymmetry") exists between bosons and the class of particles called fermions. String theory requires the existence of extra spatial dimensions for its mathematical consistency. In realistic physical models constructed from string theory, these extra dimensions are typically compactified to extremely small scales. String theory was first studied in the late 1960s as a theory of the strong nuclear force before being abandoned in favor of the theory of quantum chromodynamics. 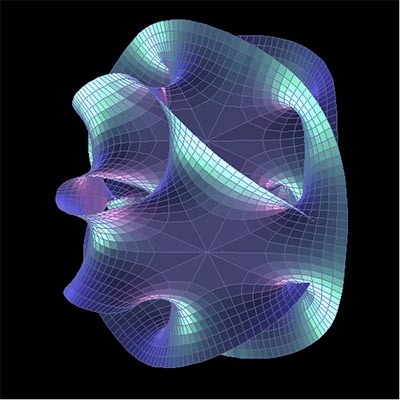 Subsequently, it was realized that the very properties that made string theory unsuitable as a theory of nuclear physics made it an outstanding candidate for a quantum theory of gravity. Five consistent versions of string theory were developed before it was realized in the mid-1990s that these theories could be obtained as different limits of a conjectured eleven-dimensional theory called M-theory. In theoretical physics, M-theory is an extension of string theory in which 11 dimensions of spacetime are identified as 7 higher-dimensions plus the 4 common dimensions (11D st = 7 hd + 4D). Proponents believe that the 11-dimensional theory unites all five 10 dimensional string theories (10D st = 6 hd + 4D) and supersedes them. Though a full description of the theory is not known, the low-entropy dynamics are known to be supergravity interacting with 2- and 5-dimensional membranes. In string theory, a paradigm shift could be imminent. In June, a team of string theorists published a conjecture which sounded revolutionary: String theory is said to be fundamentally incompatible with our current understanding of 'dark energy'. A new study has now found out that this conjecture seems to be incompatible with the existence of the Higgs particle. Scientists propose a link between string field theory and quantum mechanics that could open the door to using string field theory as the basis of all physics. Their calculations "could solve the mystery of where quantum mechanics comes from," said a co-author. Scientists at Towson University in Towson, Maryland, have identified a practical, yet overlooked, test of string theory based on the motions of planets, moons and asteroids, reminiscent of Galileo's famed test of gravity by dropping balls from the Tower of Pisa. String theory is infamous as an eloquent theoretical framework to understand all forces in the universe - a so-called "theory of everything" that can't be tested with current instrumentation because the energy level and size scale to see the effects of string theory are too extreme. A group of three researchers from KEK, Shizuoka University and Osaka University has for the first time revealed the way our universe was born with 3 spatial dimensions from 10-dimensional superstring theory in which space-time has 9 spatial directions and 1 temporal direction. This result was obtained by numerical simulation on a supercomputer. According to Big Bang cosmology, the universe originated in an explosion from an invisibly tiny point. This theory is strongly supported by observation of the cosmic microwave background and the relative abundance of elements. However, a situation in which the whole universe is a tiny point exceeds the reach of Einstein's general theory of relativity, and for that reason it has not been possible to clarify how the universe actually originated. Physicists are divided on whether string theory is a viable theory of everything, but many agree that it offers a new way to look at physical phenomena that have otherwise proven difficult to describe. In the past decade, physicists have used string theory to build a connection between quantum and gravitational mechanics, known as gauge/gravity duality. Every minute, billions of particles traveling from the sun pass through our bodies, and their trajectory continues�passing right through the planet as if solid matter didn�t exist. These are, of course, neutrinos, the particles �without mass.� While recent studies have revealed that these neutrally charged particles actually do possess mass, neutrinos remain the most difficult subatomic particles for modern physicists to study, mainly because they make so little of an impact on atomic structures as they wander about. Due to their tiny size they pass through everything, as though they were ghosts. What�s more, thanks to a few neutrinos that have actually been able to be observed through special detectors set up in a lab at the South Pole, scientists may have confirmed the existence of other dimensions.